From the last post,we know what kinds of information is being collected.In this post,we are going to check how to review privacy settings and make appropriate corrections.Please note corrections are subjective and based on your needs. On the 1st step,you can choose default audience.Please note,this is default setting.For each post,choose appropriate audience. On the 2nd step,check apps which has access to your Facebook data.Review each of the apps,if not needed remove from the list.Also note,you can recheck settings for each of the app by clicking on ‘app settings’ link. This settings control your apps, plug-ins, games and websites.Next important item is ‘Game and app notifications’.This setting controls your game requests from friends and game status updates, and app notifications from app developers on Facebook and Gameroom. On the 3rd step,review who can view your public profile ideally this should be your ‘Friends’ or ‘Only Me’.Remember your profile picture,information what you provide is always public i.e., it can be searchable by search engines. 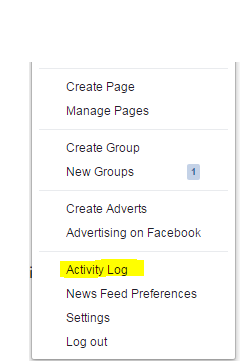 drop-down,you can select ‘Activity Log’.From here, you can click the Filters on the left to review a specific type (ex: Your Posts, Photos). You can also search and click a year on the right to see posts/photos from a specific year.But please note,activity log can be seen only by you. Activity log includes all your updates, organized by the date they happened. By default, activity log shows activity from the current year, starting with most recent activity. There is also option to click on a year (in the top-right corner) to jump directly to that specific time period.The audience icons to the right of each story show you who the story was shared with. Activity logs also shows the searches you have made,to delete the search history,click ‘More’ & choose ‘Search’ option.You can either delete individual entry or there is an option to clear all the searches you’ve made. ‘Clear Searches’. To review where your photos, and photos you’re tagged in, that are shared with Public.On the activity log,click on ‘Photos’ from the left column.Select Public from the filter at the top of your activity log next to Shared with to review what photos have been tagged. You can also review photos that you’ve hidden on your Timeline by selecting Hidden from the drop down menu next to On Timeline. 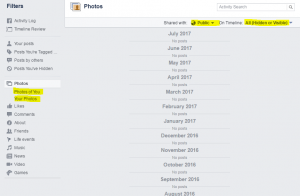 Also note, photos you’ve hidden on your Timeline are still visible to the audience they’re shared with other places on Facebook, such as in News Feed and search. Likewise,different types of stories (ex: posts by others, likes, comments) are listed in the left column of your activity log. Click on a specific type of activity in this column and stories that fall under this activity will appear chronologically in the center of your activity log.Review them appropriately and take corrective actions. Review frequently where your photos, and photos you’re tagged in, that are shared with Public.Use activity log tool to review what photos have been tagged. 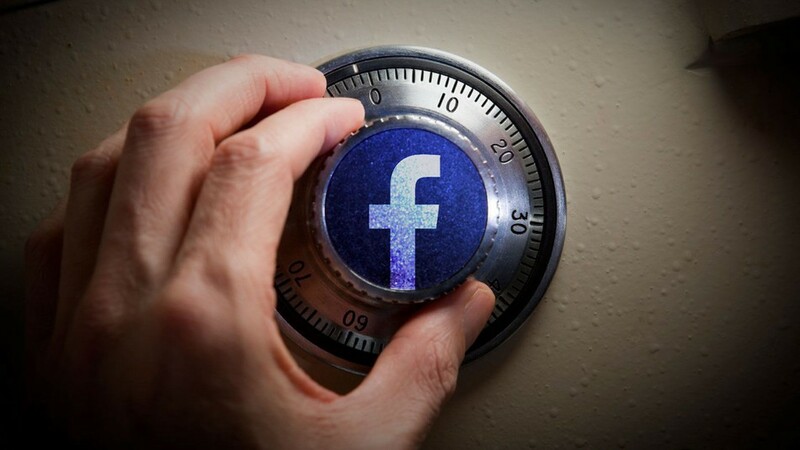 Photos you’ve hidden on your Timeline are still visible to the audience they’re shared with other places on Facebook, such as in News Feed and search.If those photos are not needed,remove it. Note if when someone is tagged in a photo you posted, that person and all of their friends will be able to see the photo in addition to the audience you chose.If you don’t want friends of the person who is tagged to see your photo, go to the photo and open the audience menu. Select Edit Privacy and pick appropriate audience. If you want to control who wants see your list of friends when they visit your profile.Change the privacy for your friend list,choose Edit Privacy option and pick right audience. If you don’t want friends of the person who is tagged to see your photo, go to the photo and open the audience menu. Select Edit Privacy option and and pick right audience. 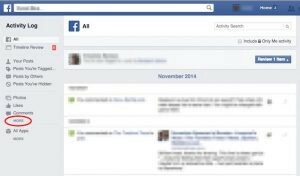 To manage who can post on your Timeline, go to More, choose Settings and select Timeline and Tagging.You can also decide whether you want to review posts that friends tag you in before they appear on your Timeline.If you’ve hidden posts from your Timeline, no one can see them on your Timeline but they may still show up in search results and other places on Facebook. Control your news feeds from certain people, add them to your Close Friends list. You can even choose to get a notification every time they post.If you’re not interested in posts from a certain friend or Page, you can unfollow them and you won’t see their posts in your News Feed anymore. Review Ad preferences by launching Advert Preferences from the home page.Go through each of tabs and make appropriate choice. *Finally,there is also option to delete & deactivate your account.In case of Deactivation, your Facebook account/ profile will be removed from the site, as will most of what you posted to Facebook, though messages and other things will be around.Deactivation can be undone. Facebook will retain your data in case you decide to come back. You can always reactivate your account later by logging in to Facebook. To deactivate your account, log in to Facebook. At the top of your Facebook page, click the down-arrow icon at far right. Choose Settings from the menu that appears, and then on the next screen select General from the list along the left side of the window.On Manage Account section you can find the option to deactivate your account. Click Deactivate your account to start the process. Deleting your Facebook account, on the other hand, kills it completely. On the Facebook account page,you’ll find option to delete the account. Hope, I have covered some important points about privacy settings,if you’ve more questions,please do post it on comments section,I would be happy to help you out.